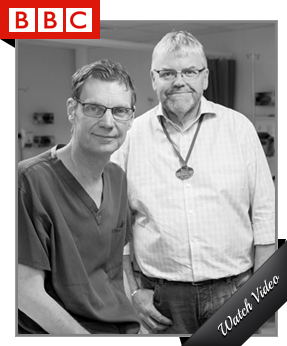 Home // News » How Safe is Bariatric Surgery? Human evolution has been inexorably linked to our ability to select, prepare and cook food. These skills conferred to early man a significant metabolic advantage. Precooked foods require less digestive effort and therefore over time a smaller GI tract was evolved, leaving metabolic room for cephalisation and the development of a large brain. Unfortunately the hunter-gatherer humans of 150,000 years ago continued to develop their skills in food preparation resulting in the advent of agriculture and farming 20,000 years ago to the current explosion in the availability sugar and highly palatable processed foods. Our relentless fascination and ability to grow and process foods, the very reason we where able to evolve to be humans in the first place, has led us to develop an obesogenic environment that is no longer suited to our health. 30% of the world’s population or 2.1 billion people are now overweight or obese 2.5 times more than malnourished people. If the current rise in obesity rates is continued then by 2050 half of the population of the UK will be obese (currently 23% of UK adults are obese). In 2014 the McKinsey Global Institute calculated that the cost of obesity to the UK economy was £47 billion per year. They compared the economic threat of obesity to the world as similar to smoking and armed conflict and more costly than alcoholism and climate change. It is well known that obesity causes a number of medical conditions. The central visceral adiposity characterised by the android fat distribution found particularly in men is a direct risk factor in the development of type II diabetes, hypertension and dyslipidaemia. This constellation of disorders, commonly referred to as metabolic syndrome, subsequently drives future risk of cardiovascular complications. What is less commonly understood are the physiological changes that drive obesity and make it so hard for patients to lose weight permanently by ‘dieting and will power’. Genetic studies have suggested that some people are sensitive to an obesogenic environment and some people seem resistant to it. In fact genetic factors contribute to approximately 85% of a persons body mass index (BMI). In an obese person the normal homeostatic factors that should maintain energy balance break down. The development of leptin resistance results in a failure of the hypothalamus to respond appropriately to the signal that energy stores in the form of adipose tissue have exceeded requirements. The physiological changes that occur when a person diets are also misunderstood. The longer the period of calorific restriction the more pronounced the rise in ghrelin, a hormone secreted by the stomach driving appetite, and the lower the level of peptide YY, the satiety hormone, secreted by the small bowel. Increasing evidence suggests that in individuals that have tried low calorie dieting in order to lose weight the appetite and satiety changes that are experienced during a diet are in fact still present a year after dieting has ceased. This explains the common description of yo-yo weight fluctuation in response to dieting, with a slow an inexorable long-term weight gain. In 2014 the cumulative evidence that ultra-low calorie dieting is in fact counter productive in weight regulation led NICE (the UK commissioning advisory body) to warn against this form of intervention for obese persons. In the face of the development of our obesogenic environment and the subsequent obesity pandemic, coupled with the failure of conservative forms of treatment for obesity it is not surprising that bariatric surgery has risen in popularity. In the US the number of bariatric procedures now exceeds the number of gallbladder operation with over 200,000 procedures performed annually. But how effective and how safe is this type of surgery? Bariatric surgery is new in comparison to most established specialities. Since the start of the rapid rise in obesity rates in the 1980’s different types of surgical procedure have come into and then gone out of fashion, to be replaced by newer more effective procedures. The reason that we see more and more patients now requesting this type of surgery is that as the obesity crisis has worsened so the safety and effectiveness of surgery has improved. The gastric bypass is considered to be the ‘gold standard’ procedure in bariatric surgery. Due to concerns about the malabsorptive complications caused by jejuno-ileal bypass the gastric bypass was developed to be a hybrid procedure combining a much lesser degree of malabsorption combined with restriction in the capacity of the stomach. It has only recently become apparent however that malabsorption is not the prominent cause of weight loss after bypass. In fact the re-routing of the bowel causes significant changes to the secretion of the appetite and satiety hormones (ghrelin and PYY). The biological signal to eat in response to weight loss is therefore switched off, making weight loss much easier for patients. In addition to this GLP-1, another peptide secreted in excess postoperatively, has a crucial role in glycaemic control and peripheral insulin sensitivity explaining the rapid improvement or resolution of type II diabetes following this procedure. Despite the good results of the gastric bypass in weight loss and improvement in diabetes it still remained a procedure performed by the open technique until recently. Open surgery carries the inherent risk of respiratory complications and DVT / PE. These risks are amplified in obese patients. The procedure was painful and required an extended in-patient stay. Therefore risk remained significant until the advent of laparoscopic surgery in the late 1990’s. The gastric bypass, initially performed as an open operation, was increasingly performed laparoscopically in the early 2000’s. Throughout the decade with further developments in training and technology, including high definition monitors, advanced stapling devices and advances in thermal dissection technology the safely of the bypass improved. A procedure that we knew to be effective in the long term, with good long term follow up data from the open era of surgery, could now be performed with significantly decreased pain and morbidity, leading to a much faster recovery. The sleeve gastrectomy has risen to become currently the most commonly performed bariatric procedure worldwide having recently superseded the laparoscopic gastric bypass in popularity. The sleeve procedure has seen a meteoric rise in popularity considering that it was rarely being performed only 5 years ago. The procedure is simple to understand and relatively easy to perform compared to the gastric bypass. Both patients and surgeons like this simplicity. Performed laparoscopically the stomach is stapled and separated. The division of the stomach begins in the antrum and continues in parallel to the lesser curvature (the right sided concave border) to the lower oesophageal sphincter area. A new tube shaped stomach is created to replace the old cavernous stomach, reducing its capacity from approximately 2,000cc to 300cc. The redundant stomach is removed.The early (2 year) results for sleeve gastrectomy as far as weight loss and resolution of obesity related co-morbidities are comparable to the gastric bypass. 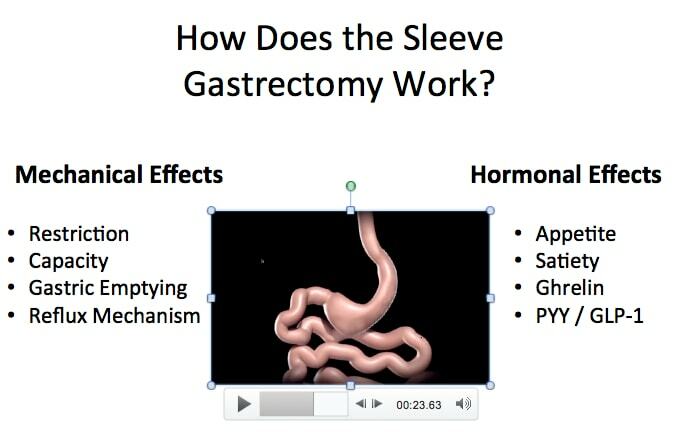 These outcomes may be a surprise if the sleeve is considered to be purely a restrictive procedure, reducing the stomach capacity, however this procedure also works to change appetite and satiety drives. The resection of the body and the fundus of the stomach removes the mayor ghrelin secreting area from the GI tract. This is the hormone that leads to a voracious appetite in response to caloric restriction. Removal of this part of the stomach nullifies this appetite response. In addition, the reduced capacity of the stomach encourages faster delivery of nutrients into the small bowel, stimulating an early and exaggerated PYY response from this area and producing an early feeling of satiety. With early delivery of nutrients to the small bowel comes a GLP-1 response similar to that seen in the gastric bypass and explaining the sleeve gastrectomies excellent effect on glycaemic control in type II diabetics. When deciding on any operative intervention, including bariatric surgery, surgeons must use their knowledge and experience to decide whether they are truly benefiting the patient with their intervention. They must calculate the risk (of significant complications) versus the benefit (improvements in health and quality of life). The risks of surgery are dependent on several factors. These include; patient factors, the type of procedure performed and the expertise of the unit. Following gastric bypass or sleeve gastrectomy surgery patients routinely report that their lives have been transformed. After decades of struggles with dieting and yo-yo weight fluctuation their weight loss is maintained. A good estimate of weight loss following either of these procedures is at least 70% excess weight lost. For example man of average height (1.75m, 5 foot 9 inches) weighing 120kgs (18 stone 12 lbs) would expect to reset his weight to 89kgs (14 stone 1lb), or lower, within a year of surgery. This level of weight loss is generally maintained long term if patients are give appropriate lifestyle and dietetic education. As well as good weight loss the sleeve and bypass procedures have an excellent effect on metabolic syndrome. Over 60% of diabetic patients will be off medication following surgery and the remainder will have better glycaemic control. The majority of patients with hypertension, dyslipidaemia and sleep apnoea will have resolution or significant improvement in their symptoms. For women of reproductive age, fertility will improve following weight loss through bariatric surgery, pregnancy will be safer and there will be less chance of emergency caesarean section. In addition to weight loss and better health, quality of life scores improve dramatically following gastric bypass and sleeve gastrectomy. Obesity, and its associated problems, can now be safely treated by bariatric surgery. The risks of surgery have significantly reduced following the introduction of new procedures, new techniques and new technology. In appropriately selected patients treated by a specialist team in a large specialist centre the risks of bariatric surgery can now be equated to the risk of gallbladder surgery. In addition the rapid and sustained benefits of bariatric surgery are now being understood. The metabolic effects of surgery on appetite and satiety driving gut peptides and on metabolism have improved our understanding of obesity as a disease. If a medical intervention that had such a dramatically beneficial effect on weight, health and quality of life and at such a low risk were discovered, it would be proclaimed the ‘trillion dollar pill’ by the pharma industry. For now, whilst we await this discovery bariatric surgery remains our only effective treatment for obesity.